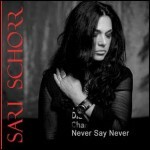 Share the post "Album review: SARI SCHORR – Never Say Never"
Sari Schorr returns with ‘Never Say Never’, an album that goes a long way to establishing her own niche. She is a versatile singer with big range and an intuitive ability to get inside a song, and phrase accordingly. Perhaps that’s why she uses Ian McLagan’s ‘Never Say Never’ as the title of the album. It’s a stellar example of her interpretive abilities as she bookends the album with a soulful track and a search for spiritual depth. Given the nature of her own autobiographical songs – there are half a dozen here – you suspect it’s her ability to empathise that drew her to the song. Her biog significantly focuses a great deal on her hard working career, and her constant travelling and touring. It’s a significant angle because having made splash with her aptly titled ‘A Force Of Nature’ album, her job now is to nail her own consistent signature style. And this album goes a long way towards doing just that. Roughly three quarters of the material is an excellent appraisal of a vibrant blues-rock singer with a big range, who revels in autobiographical songs and occasional broader universal themes. But having made her initial impact and peaking with the confessional ‘Valentina’ and the reflective radio friendly and Kim Carnes sounding ‘Turn The Radio On’, she veers towards the retro FM rock market with ‘Back To LA’. The latter doesn’t quite carry the same emotional weight as her other autobiographical songs, while the heartfelt ‘Freedom’ – a song about gun control – has the kind of chanted hook that usually rescues a forgettable number. Those hiccups aside, there’s plenty of memorable stuff here. She opens with ‘King Of Rock & Roll’, a song based on the overly familiar Robert Johnson mythology which could have been her undoing, but her exuberant phrasing soars above a percussive intro and Ash Wilson’s fiery solo on a great opening track. Wilson also adds some Hendrixy wah-wah on the intro to ‘Thank You’, a boisterous rocker with a punchy feel. The hard hitting relationship song is mirrored by the kind of pounding rock arrangement that is extended into a wall of sound with significant chord changes on the big hook of ‘Maybe I’m Fooling’. There’s also a good version of Mick Ralphs’ ‘Ready For Love’. In the context of this album the old Bad Company favourite acts as a signifier for a 70’s rock audience in search of familiarity. ‘The New Revolution’ is also a sledgehammer rocker but with a similar heartfelt universal message as ‘Freedom’. She’s at her best when the Schorr/Gehrke song writing partnership focuses on her autobiographical songs such as ‘Valentina’. Ash Wilson guitar work intuitively supports a song that fits seamlessly into a sequencing that pays dutiful attention to flow. This entry was posted in ALBUM REVIEWS, ALBUM REVIEWS (Mobile), All Posts and tagged album, Ash Wilson, Bad Company, blues, Henning Gehrke, Janis Joplin, Jimi Hendrix, Kim Carnes, Mick Ralphs, Never Say Never, review, Robert Johnson, rock, Sari Schorr, soul, vocal. Bookmark the permalink.